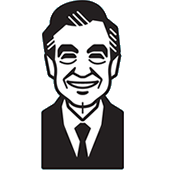 You may recall the Neighborhood Trolley lapel pin which has been available through the Fred Rogers Company online store for quite some time. Now there is a similar option for fans of Daniel Tiger's Neighborhood. 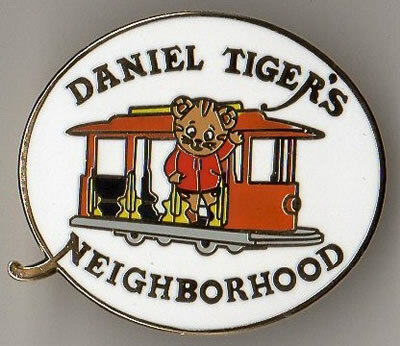 Much like the Trolley pin, the Daniel Tiger's Neighborhood lapel pin is made of a heavier material and has somewhat of a metalic look to it when seen in direct light. Measuring approximately 1 1/4" wide, this pin is a bit larger than most lapel pins. One unique feature of this pin is found in the logo itself. Looking at the "N" in "Neighborhood," you can quickly see that the design of the logo extends beyond the edge of the pin. While there may be concern that this compromises the quality of the pin, this small extension is solid and would take a pretty good amount of force to break off. Want a Daniel Tiger's Neighborhood lapel pin of your own? Stop by the Fred Rogers Company online store and pick one up for about six bucks (shipping included). As always, find this lapel pin and more Daniel Tiger's Neighborhood merchandise and memorabilia detailed in the Daniel Tiger section of the Neighborhood Archive.